Over the years a relationship has been built up between a small group of balloonists from the Sussex area and a Tuscan balloonist, Stefano, who runs a ballooning school and flights from his small holding near the small town of Tavarnelle val di Pesa, about midway between Florence and Siena. 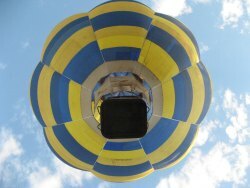 Conveniently, Stefano also has an LPG gas bottle filling facility, essential for balloonists. 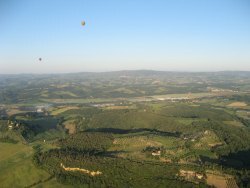 A stone throw away there is a family run villa where the Sussex balloonists base themselves, and an equally strong relationship has been built up with the Tuscan family. Indeed the family insists on cooking a meal one evening for the English balloonists every time they turn up; real Tuscan hospitality. Tavarnelle val di Pesa is situated 12 miles south of Florence on the hills along the Pesa valley. 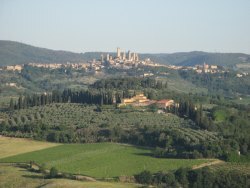 It is located at the ancient crossroads of two Roman roads -- the "Via Cassia" leading from Florence to Siena and on to Rome, and the Via del Chianti towards San Donato and Castellina in Chianti. The undulating hillsides of Tuscany contain hilltop towns, castles, valleys, famous vineyards, and mixed woodlands including liberal sprinklings of tall cypress trees. The rural tranquil landscape has been completely cultivated over the centuries with every patch of earth acting as host to olive trees, vineyards, and corn fields. 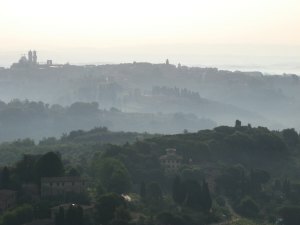 On a clear day Florence can be seen to the North with the Apennine mountain range in the background; to the West you can sight the Elsa valley, San Gimignano, Certaldo, and Volterra and the sea in the far distance; to the South, Poggibonsi, Colle Val d'Elsa and Siena and Monte Amiata in the distance; to the East the higher Monti del Chianti and mixed oak woodlands. 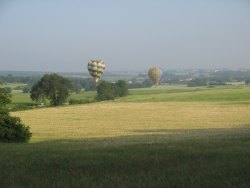 In 2009 the syndicate took one balloon over to Tavarnelle, as did another team from Sussex, and an excellent week's ballooning and sight-seeing was had by all. I took the liberty of travelling out early to spend a few days in Florence absorbing the art galleries. 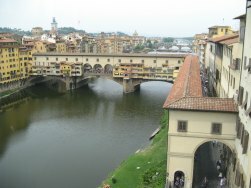 I had always planned to travel to Florence to take in its abundance of art, and I was in my element visiting the Uffizi and Accademia galleries. It was whilst waiting hours in a queue to enter the Uffizi that I got chatting to a Dutch couple. They had cycled all the way down from Holland, they looked incredibly fit, and what's more they were the same age as me. Hope for me yet! My son came over at the end of the ballooning week, and we spent time exploring Florence, Siena and Pisa together. 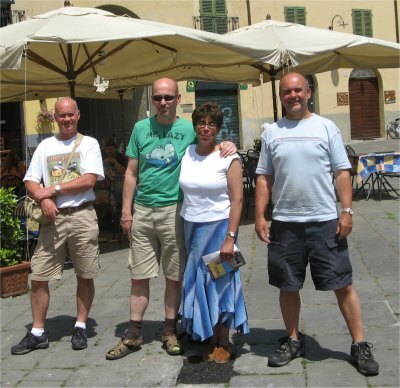 The syndicate team are shown here relaxing in Lucca, from left to right: Chris Cronin, Niall and Liz Rowan and yours truly. I had ballooned with Niall and Liz many times before in the UK, France, Germany and Ireland; a pleasant, easy going couple. Chris worked as a lab assistant at a school and had managed to escape for the weeks ballooning. I soon learnt he was passionate about motor cycles, a passion that was equally shared by Niall. I think that is how they first met. This small team gelled well. Niall was the only pilot between us, and the rest of us shared a rota of passenger or retrieve crew. Cooking duties etc were shared by all. In addition we all had a common interest in wanting to explore the surrounding historic towns and countryside. 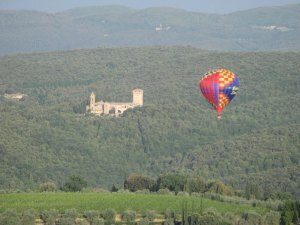 Take-off, flying over the Tuscan vineyards, and a perfect landing. In Tuscany, land not covered by woodland is either full of vineyards or olive groves. 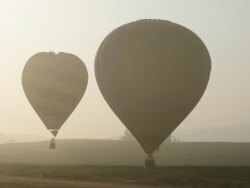 Pilots often have to resort to landing on footpaths or the sides of fields, a task to test the competency of any balloonist. Niall did a splendid job here landing on a track running through the middle of a vineyard. 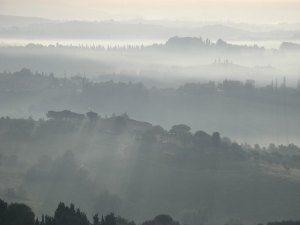 Tuscany is unique in that only morning flights are possible since the evenings tend to be fairly windy and therefore unflyable. 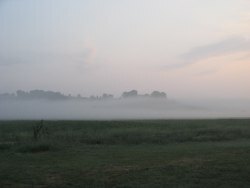 Often the early mornings are misty, but so long as the ground and hazards can be made out, flights are possible. Taking off and looking down over mist filled valleys, watching the sun slowly wipe away the "sleep" from the face of the earth is a wonderful experience, and never ceases to enthrall me. Drifting quietly over the low hills surrounding Siena, one of the best preserved medieval cities of the world (see adjacent photo) is unforgettable. Tuscany is a remarkably beautiful region. As can be seen in these photographs, landing sites are hard to find in Tuscany; deciduous trees for miles around with the occasional castle and villa poking out of the canopy. Some days you have a decent wind speed that will take you for miles, but with the associated hard landing at the end of course. On this fast and long flight passing over Poggibonsi we caught sight of San Gimingnano in the distance. If you are ever in the area, you must visit San Gimingnano and its historic towers. On other days, you can wait around for ages for the mist to clear sufficiently, and there is usually hardly any wind on such days. On this particular morning the flight was a lazy drift for a couple of miles, by which time the mist had vanished. What is rather unusual is that a field of stubble was available for the gentle landing. Here we have from the left the Ponte Vechio in Florence, the Palazzo Pubblico and Piazza del Campo in Siena, and of the course the Leaning Tower of Pisa. 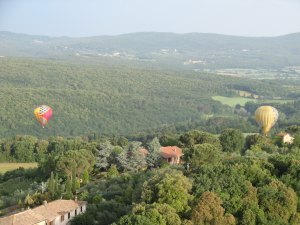 This excursion into Tuscany was delightful: the selfish 'my time' on my own taking in all the Florentine artworks, the ballooning week with the team including our trips to Siena, Lucca and San Gimingnano, always full of bonhomie, and rounding off by sharing Florence, Siena and Pisa with my son. I would certainly return to this wonderful region again.